Is Your Child Ready for a Horse? What do you do when your child is begging for a horse or pony? How many little girls watched the movie 'Dreamer' or 'Black Stallion' and decided they must have a horse. A child may become inspired by a book, equine performance or movie, and suddenly they are 'galloping' everywhere whinnying when you call them. For some, this may spawn a life-long passion, for others, the excitement may cool. Wait it out and a new passion may develop. Is It Your Child Who Wants a Horse? Many adults have dreamed of owning their own horse and project that dream on to their children. Then the parents are disappointed because the child is not fulfilling those dreams — whether in the show ring or at home. Make sure it is really the child who wants the horse, not the parent. Even if your child is a teen, you’ll still need to drive to the feed store, the tack store, call the veterinarian, and arrange for the farrier. Buying a horse is not like buying a bicycle for your child. Horses are high maintenance and you can’t just lean them on the garage wall and forget about them until your child wants to ride it again. If your child is the only one really interested in owning a horse do you want the extra responsibility? Not everyone can afford to buy a horse or has the time horse care takes. As a parent, a good deal of the expenses and time horse care requires will fall to you. Are you willing to learn about horse care? Some parents take this on happily. For others, it's not a consideration for many reasons. There are parents who will not let their children ride until they are twelve or more because they believe you must be a physical presence on a horse. There are children who are much younger that are excited to help look after their pony or horse and cry when they have to go home or get off. A child should be old enough to 'help' groom, feed, water and muck out and do so willingly. The exact age will depend on the child. Consider how your child helps look after any of your pets at home. If you have to beg and cajole your child to look after a dog or hamster, you may find yourself doing the same thing with a horse. 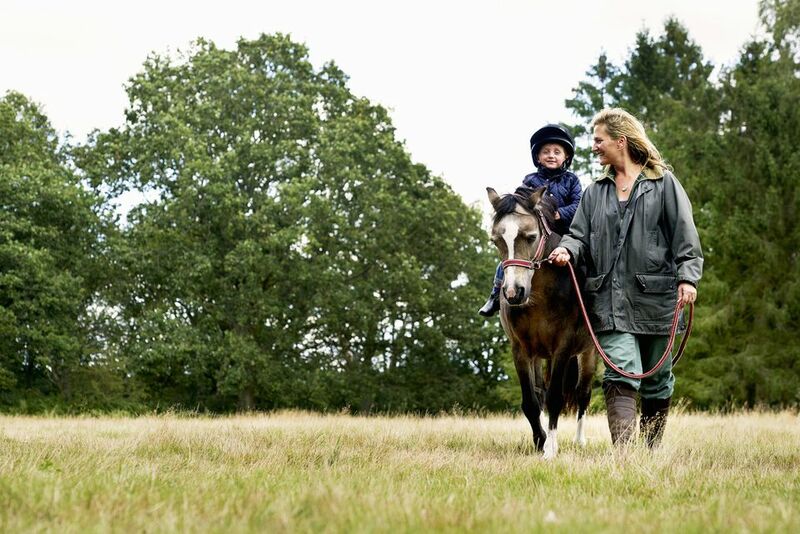 If buying a horse is a consideration your child should be taking riding lessons first. A good sign of your child's dedication is the eagerness with which the lessons are anticipated and the amount of time your child spends caring for the horse before and after the lesson. Your child should eagerly participate in all aspects of the horse's care, not just time in the saddle. If month after month you have to tear your child away from the stable that's a good indication your child is dedicated. You can also ask the barn owner or coach if they think your child is ready for their own horse or pony. Can You Provide Alternatives to Ownership? If the answer is no, we can't buy a horse, there may still be inexpensive and less time-consuming ways to feed your child's passion for horses. Discuss alternatives. Can you afford twice weekly, weekly, bi-weekly, or monthly lessons? Can you take them to trail rides and camps? Can you part-board or lease if buying is not an option? Can your child work at a stable or help out a horse-owning friend? There are lots of ways to be involved with horses without actually owning one.